PaxPrime. The biggest gaming event in North America was held in August in Seattle with tons of crowds, lots of lights and sounds, an abundance of games, a smattering of cosplay, and plenty of fun. At $40 ticket/ per day, it sold out in less than 1 hour. We had the opportunity to get in on the action. Pretty cool projects pass through our manufacturing facility and this Logitech Race Car simulator via Studio Blue is certainly one of them. The simulator is designed with movement to engage the senses and make it a one of a kind experience for customers. The simulators were positioned in front of a towering MultiQuad® featuring the signature colors of this technology super power. People were lined up to take a “spin” in one of these simulators at PAXPRIME in Seattle. Even celebrities wanted to take a drive. NFL football player, Hank Baskett, tested out the torque of this incredible interactive exhibit. In March 2014 I took a trip to Las Vegas for the Exhibitor Show. With a marketing career spanning 2 decades, I’ve been to countless trade shows and lost count of the number of trips I’ve taken to the trade show mecca around the time I stopped carrying my laptop on a plane. But this trip was a first, my virgin experience on the other side of the aisle. I was on there to sell, not to be sold…and was I prepared! Up comes #2, “Where’s the bathroom?” “Sigh“. I’d prepped, I’d studied, I’m ready with my script and ready for the big questions. So here comes Beeline Betty, “Pardon, but do you know how I get to show services?” What the What?!?! Come, on. Of course, I told pointed to the rest rooms, it’s woman code. Perhaps being the only woman in the booth on a main aisle crowned me the Queen of info. Or maybe it was the librarian shoes that made me look extra knowledgeable? But my Vegas bet lies squarely on inferior wayfinding tools. So once we found out we’d be occupying the same space for the next show, I knew we needed a plan. Wayfinding is one of the services of our interiors division, so it’s on my radar. The plan was pretty simple, and as with many simple and obvious plans … IT WORKED! We embedded a show floor map in our graphics. It added another reason for traffic to stop at our booth. Were we showing competitors spaces? Yes, who cares. It’s not proprietary information. It was usable information. I asked permission from the show and then obtained a high resolution map of the show floor, altered with large red restroom symbols and built it into the edge of our display. Although I never mind providing directions, instructions and courtesy, I have to think most people really want to find that information out themselves. We made an easy way for people to get the info they needed, and we provided another reason to stop, look and engage. https://expodisplays.com/wp-content/uploads/2015/09/Restroom.jpg 3264 1836 terri parker https://expodisplays.com/wp-content/uploads/2015/07/Screen-Shot-2015-07-02-at-12.23.31-PM.png terri parker2015-09-17 22:07:412015-10-12 22:08:59Where's the restroom? Think about it. We’ve all had managers at a new job who said, “If you have any questions, just ask!” But do we really always ask? Often times not. After all, we’re professionals, we’re experienced, we’ve been in a marketing job for a few years now and we feel confident! We’re trying not to look too green our first week. Plus…there’s Google and Wikipedia. Wrong. Tried searching “prospectus” lately? It’s one thing for the finance world but something very different in the trade show industry. What about “drayage?” I thought that had something to do with a horse show and why is it something so vitally important to our business? You don’t want to ask your boss every time you run across something new. You want to do your research and be informed. So, download this easy glossary of trade show terms. Then, you’ll know! Early to bed, early to rise, work like heck and amortize! Well the saying may be “advertise” but in the trade show industry, if you aren’t amortizing your trade show exhibit, you may be short changing your opportunities. With the average life of an exhibit being around 5 years, it is wise to use that longevity to your advantage when considering your show budget. If you do 6 shows per year, proposing a $120,000 display may not hurt so bad when you realize that is only $4,000 per show. Let’s take a smaller inline exhibit of $20,000. 5 shows per year for 3 years amortizes to a little over $1300 per show. In your overall show budget, the exhibit itself may end up being one of your lesser expenses. When considering whether or not you can afford a new exhibit this is an important step. Don’t treat the exhibit as an after thought or a one time purchase. Think of this tremendous branding tool over the span of its use. On the heels of a successful Exhibitor Show and EuroShop visit, I thought I would share some conversations that I had with industry veterans regarding two interesting subjects that seem to continue to gain traction. Firstly – The concept and implementation of a Cubic Content booth formatting, whereby the in-line exhibitor would have the ability to use full height display structure at not only the back-wall but also side walls up to the aisle line. This booth space exhibiting concept is widely used in the global marketplace – and some (I applaud them) show organizers within the U.S. market are starting to offer. This concept is a win for all: International exhibitors visiting, exhibitors in getting additional messaging area, builders by providing equipment, shippers, handlers and installers by moving or working with more display properties – seems like a winning combination that benefits not only the industry but all in it. For many years the gold standard for exhibit layout has been some of the guidelines issued those many years ago by some of our industry associations – perhaps in this global exhibiting age we should review and possibly rewrite or adjust some of those standards to reflect today’s global exhibiting community. Lets move forward. Secondly – One conversation hinged on the concept of perhaps including the show freight handling and perhaps making it a part of the floor space square footage cost (there are currently some existing U.S. based shows that work very similar to this). This is an interesting concept as it presents an opportunity for the exhibitor to know in advance what their costs for a show are going to be thus helping them control their budget – in that case it would not matter what exhibit property they sent to a show, their material handling costs would be already paid for (generally in advance). the win here could potentially be for everyone – Exhibitor’s know there costs going in, show organizers know the material handling up front based on exhibitor floor space. Sounds like a workable and viable alternative. I am just back from the ESCA 2014 Summer Educational Conference that was held in Miami Beach. Great networking and educational opportunities, some of which I thought I might share. Of particular interest was a presentation by Brian Casey with CEIR (Center for Exhibition Industry Research) as to the industry and current observations. Approximately 2/3 of the shows held are owned or run by Associations with the remaining third being privately held. Associations rely heavily on their shows to help generate revenues to administer their associations – it was estimated that some Associations rely on their show to generate 40-70% of their operational budget revenues. As of Q1 2014 there have been 14 positive quarters of growth for the industry (although some of that has been sluggish) and it was reported that the industry is almost on a par with year 2000. Exhibitors are increasingly concerned with their budgets – the two largest areas being weight (shipping / drayage) and exhibit build costs (could be a reason for so many Exhibitor’s considering more modular products). It was reported that exhibiting space in the U.S exceeds the current demand – yet many facilities are being remodeled, enlarged or built new in anticipation of new shows or opportunities. Many older facilities are aging and trying to catch-up. These were but a few of the informational snippets available and reported on during the conference. CEIR offers their research and reports to their members, non-members can purchase various reports. CEIR does partner with other Associations (like EDPA) and often shares some research with other association’s members. Jay Burkette, a 30 year tradeshow industry veteran is the Vice President at ExpoDisplays and the current President of the EDPA. Are you frustrated with the time it takes to vet a new exhibit house? Frustrations from the traditional RFP process, led ExpoDisplays to take steps to gain RFP Certification from EDPA. Conventional RFP processes put countless hours of work on those seeking to purchase an exhibit. 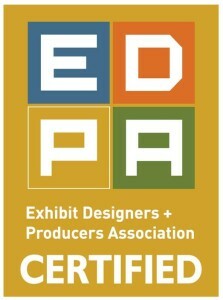 With the new certification, the time and work has been done for the customers by EDPA. The certification is only awarded to companies who meet the most stringent standards for business practices in the industry. RFP Certification assures prospective clients that the member company adheres to industry standards and best practices relating to ethical business practices, industry experience and participation, fiscal responsibility and operational methodology. The EDPA RFP Certification Program was launched in early 2014 in response to an industry survey of corporate trade show exhibitors that revealed a desire for more transparency and consistency during the RFP process. iCompli, a division of BPA Worldwide, a not-for-profit international auditing organization headquartered in Shelton, Connecticut developed the certification protocols for the EDPA RFP Certification Program and performs the independent third party certifications. Traditional RFPs take hours to complete during the onset of the project and the back end of the project, this new certification was developed to help eliminate that. Now it’s time to streamline your RFP efforts. Let the suppliers do the work for you! Revitalizing the way you exhibit can be a daunting task. But few things can add fresh impact to your face to face marketing, than breathing new life into your exhibiting. Add elements of engagement within your design. Have something that people want to touch or hang around for. Visually keep your visitors interested with your exhibit design by providing a tactical element that will capture their attention and help them remember you. Rent. If you want to try a new design that really pushes the envelope, consider renting. You can go all out with the graphics and your new direction as a test without the financial committment of buying an exhibit. Get creative in giving a rental the look of a custom exhibit. Get Someone Else to do it for you. Find an exhibit designer and manufacturer that is a partner in your exhibit program. Finding a low cost provider is easy online, but that leaves all the work up to you. Instead consider partnering with a new company that will keep you current on industry trends, remains focused on quality and frees you up to do your job. Now, say goodbye to the old way you exhibit and put your face to face marketing to the test with your new direction. Over the years I’ve watched exhibitors spend lots of time, energy and effort trying to save money on display I&D (install/dismantle) labor. Maybe we hate paying someone else to do something that we can do? Maybe it is because labor rates are so high ($150/hour in New York for example)? Whatever the reason, exhibitors go to great lengths to minimize labor costs. But is it worth it? Or is it wiser to use professionals for the job. By “professionals,” I don’t mean ordering “two workers” from the show’s general labor pool to handle your I&D. They may do a fine job, but here I’m referring to professional I&D firms that specialize in trade show display I&D. Before I get into the reasons to use I&D firms, let’s cover the ONLY reason not to use them, and that’s to try and save money. The only potential benefit to your employees installing the display is that it may cost you less. Keep that in mind as I cover some reasons I believe you SHOULD consider using professional I&D firms. They will do a better and faster job. You probably do a better job of what you do in your daily work than the professional installer could do. But the reverse is also true. He/she will outperform you when installing displays. For every display you have set up, the average I&D guy has probably installed 200. Who is better at setting up displays? Your sales reps? Your marketing assistant? Your VP of sales? Or a guy that sets 200 up each year? They solve problems better and faster. As an exhibitor you know that Murphy’s Law applies at trade shows. Anything bad that can happen will happen. And someone that does this for a living has seen it all. He knows how to solve problems and save the day. He has likely seen that exact same thing happen dozens of times with dozens of different clients. He has a better chance of solving problems than you and I do. Also note that if you need power tools, ladders or any other equipment, the I&D firms will have them. They work to earn and keep your business. Unlike someone you hire from the show’s general labor pool, professional I&D firms are in it for the long haul and only survive with repeat business. If they don’t do a great job for you in Las Vegas, then you won’t use them in Orlando. What does that mean to you? It means they will work harder, faster and generally do a better job for you. And that “faster” part is key—the faster they work the less you will pay. You can actually save money by using a professional I&D company over the general show labor, even though the hourly rates are more expensive. They are not as expensive as you think. Just because your employees set up your display doesn’t mean it was free. Let’s assume a show in Las Vegas with a 10’ x 20’ display that takes 8 man hours to install and 8 to dismantle, both on straight time. That’s 16 man hours and with the I&D firm at $88/hour your cost is $1,408. Now if you use two $40,000/year employees and assuming they can set it up in 16 hours (doubtful) that’s $307. You have to send them out a day early (install) and keep them a day late (dismantle) so that’s four extra hotel nights at around $700. Taxis back and forth both days will probably run $100. And with per diem or meals you’re in for another $300. Add those up and you’ve spent $1,407. So there you have it—you have “saved” $1. Don’t take my word for it, run the numbers yourself on your next show and see what you find. And don’t forget that your labor is not as good as theirs (see 1, 2, and 3 above). Even if the I&D firm is twice as expensive they still may be worth it. You have better things to do. I don’t know what you do at your company but I’ll bet it is not install and dismantle of displays. So why would you or your employees do it? If you’re installing a display then you’re not doing whatever it is you do best to grow your company. Same for shipping—you don’t drive the display to the show—you hire someone to do it for you. Employee resources are scarce. My advice is for you and your employees to do what you do best and hire others to handle I&D. You’ve made the commitment to exhibit at a tradeshow, but many questions still follow. Here are a few tips that may help you out. How much booth space do I need? This depends on a number of factors like how many sales people will be working your booth. A good rule of thumb is each salesperson needs 25-50 square feet of space. Next, how much product will you be displaying? Will you need a conference area, demo area or storage? Finally, how many clients and prospective customers do you expect? The ultimate goal when choosing the size of your exhibit space is to have room for all visitors without having too much additional space. You also need to understand the rules at your particular show about the placement of your exhibit within your space. Another point to consider is the budget for your actual exhibit. Would it be better to have a 10 x 20 trade show booth with extra space and a budget-stretched display? Or would it be better to invest the extra money in a traffic stopping display in a 10 x 10 space? How do you choose your exhibit space at a show? First determine what is available to your company. One important thing to know is that show management gives priority to repeat exhibitors and large exhibitors. If you’re a small and/or new company, your choices may be limited. aisles leading to meeting rooms. dead end aisles, freight entrances, extreme corners and aisles farthest from the center of the exhibit hall. Now that you’re armed with the know-how, highlight your three most desirable spaces, check availability and book your space!